I’m going to tell you how to leverage testimonials and reviews and use them to get more clients, and I’m even going to share my very best secret for getting the exact type of testimonials you need to turn prospective clients into paying clients. First things first, are you worthy of good reviews? The best reviews come from people who are thrilled beyond belief with both your products and your service. While it’s great to get testimonials about how beautiful your images are, it’s even better to have reviews about how amazing it was to work with you and how your customer service was outstanding. People flock to businesses with amazing customer service. So make sure yours is top notch and that you’re always surpassing your clients’ expectations when interacting with them. The most effective places to put testimonials are places where people may have hesitations or asking themselves if they should book you. Testimonials speak to your client’s hesitations, even before they realize they have them, making your business a more compelling choice in their minds. 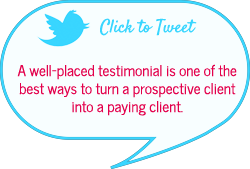 A well-placed testimonial is one of the best ways to turn a prospective client into a paying client. Let’s look at these places. When people first come to your site, they’re trying to decide if you’d be a good photographer for them, and you NEED to have a good first impression or they’ll just click away. I want them to see a good testimonial right away because I want their first impression of us to be a positive one. So when you visit our wedding photography website, you’ll see a slideshow on the homepage that has 3 images with a testimonial on each image. Here is one of the photos (click to visit our Madison Wedding Photography site and see the entire slideshow). Finally, the last vital place that I suggest using testimonials is on your pricing page. I’ll talk about that in the next section. What kinds of testimonials are the most powerful? 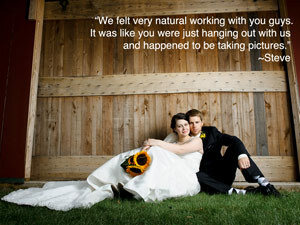 As photographers, most of the testimonials we get are going to be about how beautiful our work is. This is great, but the most influential testimonials are the ones that speak directly to someone’s hesitation and convinces them that it isn’t a problem when working with you. Just as they’re wondering if you’re worth the price, BAM! They’re hit with a testimonial that tells them that it’s worth it and they won’t have any regrets. See how strategic you can be with these? So much more powerful than hiding them away on their own little page where no one may ever look at them. So how do you get these perfect testimonials? Ask for them. But be strategic about what you ask. If you come right out and ask “hey, could you write about how we were worth the money?” it’s going to sound fake, even if they are glad to write it and mean exactly what they are saying in their testimonial. Instead, ask them leading questions that will give you the testimonials you want. Create a survey for every client to fill out after working with you. Not only will this give you great testimonials, but it will help you improve your service and learn exactly what your clients think about working with you. Some of the answers you get back may be difficult to hear, but it’s the only way to improve and move forward so take both the good and the bad and do your best to keep improving all the time. There’s a perfect testimonial for your pricing page. Sit down and think about all the hesitations people may have while considering your work, and come up with 3-5 questions that you can ask them using a client survey that will speak to these hesitations and help people overcome them. Don’t ask clients to answer more than 3-5 questions or they will be annoyed and possibly not finish filling it out. Make it quick and easy. If you have more than 3-5 questions you want to ask, simply create more than one survey and just give different surveys to different clients so that you can get the testimonies you need. There’s lots of things you can use to make a survey. I LOVE Gravity Forms for this, because it’s easy to use right on my website, it’s super-customizable, and I can do conditional logic with it. I highly recommend it. Bonus resource: Check out this link for free speech and thought bubbles (that include free commercial usage!) to make your testimonials stand out even more! Testimonials are incredibly powerful, so don’t waste them. Put them to work for you, and see how it helps you to get more clients. 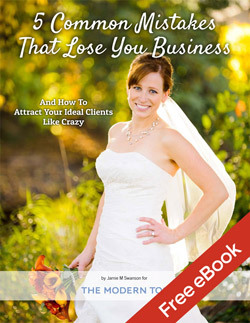 If you like this post, check out our free e-Book called “5 Common Mistakes That Lose You Business (And How to Attract Your Ideal Clients Like Crazy)” I know you’ll love it. What kinds of questions will you be asking in your surveys? Leave a comment below listing them out and share with everyone. It’s a great way to contribute and be part of the community, which is what this site is all about!